Frank Oz tells an anecdote about performing with Jim Henson in a still from Muppet Guys Talking. Last year, a wonderful documentary about the Muppets and the legacy of Jim Henson premiered at South by Southwest. After months of waiting for its post-festival release, finally some excellent news: You’ll be able to watch at home or wherever you want in two weeks. There’s also a new trailer to give you an idea of the fun you’re in for. 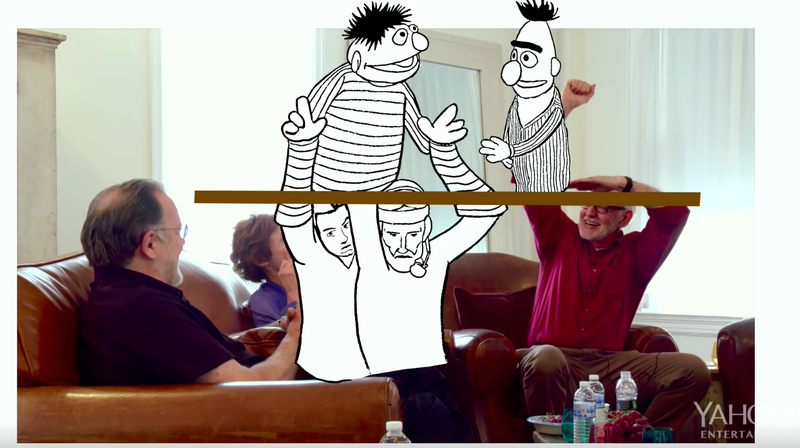 Yahoo posted the new trailer for Muppets Guys Talking, produced by Victoria Labalme and directed by Frank Oz. The movie brings together performers who worked with Jim Henson to create the iconic characters known all over the world. I saw it at SXSW last year and loved it. A release date of March 16 has just been announced, along with the news that the film will only be available via direct download. As I noted in my review from last year (linked above), Muppet Guys Talking goes to some very insightful and poignant places. If you love Miss Piggy, Grover, or Gonzo, or just want to learn more about the evolution of the Muppet characters, you’ll probably want to watch this movie.